The L-T Experience: Food Friday: Play Dough! OK so it's Food Friday. I'm going to share something with you that I made from a recipe. Not really... But I did have to cook it. Hah! Get your mind outta the gutter!!!! 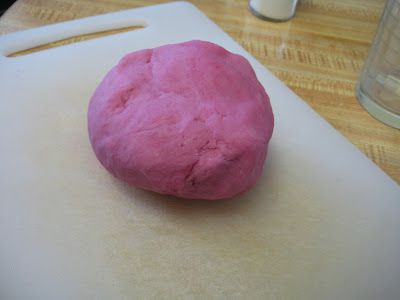 Lane was using the old Play Dough up until last week when Terry declared that it was too dried out to use. It actually broke the Play Dough Hamburger maker thing. ACK! Lane was so sad and Logan was refusing to share some of the new Play Dough he got for his birthday. We were going to buy some more this weekend when I remembered that my mom used to make Play Dough. I looked up a recipe and voila! I found a perfect one here. I cooked it up and it came out exactly like the store bought stuff. Same texture, smell, and pliable-ness. I even put it into the empty containers we had.